The HTC Desire HD users can now enjoy an improved Android experience on their own smartphone as a new custom ROM firmware has just been made available. No, it’s not Jelly Bean as many expected, though this update is coming with important features and capabilities which will easily power up the performances of your phone. Therefore, in today’s step by step guide we will be checking in how to flash the XRom Ice Cream Sandwich 4.0.4 OS on your HTC Desire HD device. Read all the following lines as I have listed the features list, the pre requisites and of course the steps that will take you through the installation procedure. The ROM was developed by those of xda-developers and according to them this is the most stable version of the software so far, the same that was ported to the Incredible S and Desire S smartphones. Anyway, as this is a custom ROM there might be some issues in the system too, but not important ones, so you have nothing to worry about. This should be the perfect update for you, at least until the Jelly Bean one comes out. But let’s see why to apply the XRom platform on your HTC Desire HD. First of all, the OS is featuring the Sense 4.0 UI along with appealing HTC themes, wallpapers, textures, effects and more. Then, there will be added features that cannot be found in the default version of the ICS platform. In this way you will be able to gain more speed, more control over the internal system, optimize the RAM memory, an improved battery life and an improved web browsing experience. 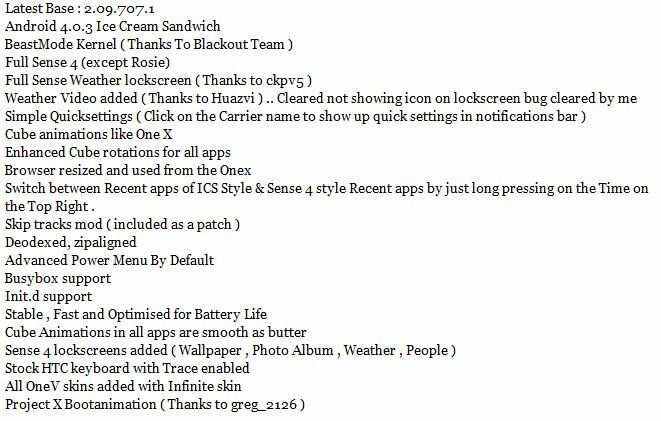 For a better view about the future features and capabilities which will power up your handset, check the list from below. Also, take a look over our how to section as you will be able to find other updates suitable for your Desire HD; choose the one that you like the most. The XRom ICS 4.0.3 Custom ROM Firmware is being offered by third party devs, so the update has nothing to do with HTC. Unfortunately there are no words about a possible release of an Android upgrade for the Desire HD devices, so flashing a beta firmware seems to be the perfect opportunity for you. Be aware though as the installation process is a complex one and requires your full attention. That’s why you must first root the HD as with a looked system you will not be able to apply the below steps. Also, take note that once you start rooting, the warranty of your smartphone will be void. So, use a tutorial for completing this task and try not to mess things up. Download SMS backup and restore apps for Android. Download Call Log backup and restore tools for Android. Learn how to sync with Google for saving the contacts. Use a custom recovery image for backing up the current ROM. Use a computer for saving other files from your handset. The backup is only one part of the preparation operations. The full pre requisites list is below, so go and complete it before starting the proper how to guide. Don’t skip any section of the present tutorial as you can end in bricking your HTC Desire HD, not to mention that updating it is out of question. Root and install a custom recovery image. Ensure that you have access to a Windows running computer, to your smartphone and to its USB cable. On the PC and phone deactivate all the security programs, like antivirus and Firewall protection. On your handset enable the USB debugging option. In the end, just before starting the steps, charge the battery if there is less than 70% power left. You can now safely head to the final part of this step by step guide. Make sure you are applying the update only for the HTC Desire HD devices and not for similar phones because you will brick them. Use your computer for downloading the update file. Then connect the phone with the PC. Select the downloaded file and copy it to your handset. Reboot it in recovery mode. For recovery: press and hold Volume Down button while powering on. Once in recovery, select “wipe data factory reset” and “wipe cache partition” (remember to backup the data first). Return to the main menu by selecting “+++go back+++”. Pick the update file and install the same. In the end, select “+++go back+++” and “reboot system now”. Well, that was all; you have managed to succeed in installing the XRom ICS 4.0.3 Custom ROM Firmware on your HTC Desire HD smartphone. Remember that this a third party developed software so there might be some bugs in the system. Test it and then return here and share your impressions with us (use the comments area from below). Also, stay close as a Jelly Bean update should be released soon and we will come with a suitable how to guide. i have i ball andi 4.7g cobalt , how i can upgrade it from 4.1 to 4.2 ? I have HTC Desire HD and the attached pictures are the information of my phone HW and SW. I did your steps above exactly as you listed them and everything worked fine and after the first reboot (step 14) I received the white screen with the green HTC in the middle but then the device got stuck with blank screen and a dim light. I thought it might be the installation taking long time but I left the device running on such case (blank screen and dim light) for about 60 minutes and nothing happened after that. Would you please help me with the update of my HTC Desire HD? What part that not work with this ROM? and which better comparing to SVHD ROM?